And yet, the stories keep swirling. They are pieces of what has shaped me. The people from my past helped make me who I am. I think of some of them OFTEN. I think of some of them rarely. I think of a lot of them with curious frequency lately. How does an incident from your childhood or early adulthood or even last year build the you that sits here now? How do the events chisel away to get to create YOU? Not just the big events either. Those make sense in many cases. But also the little events. I was thinking this morning of riding around town in my high school boyfriend’s convertible with two of my best friends. There’s not much else to the story–we were heading to lunch, probably, and there was sun and music and laughter and wind through my hair. How does that moment work to shape me? How does that memory, layered on other memories, building a tower of remembrances and moments…how does that influence the Ginger that is sitting here right now? Or does it? Is it just a nice memory, but not something that has helped shape me? Is it just a thing, that happened? The other day, I was sitting on the couch with Jackson watching TV. He was curled up under my arm, and we were watching TV. I went to move him, so that I could go change my clothes, and he freaked out. He wanted MOMMY (I already miss mama, I’ll be honest). He grabbed my arm with his little hand and pulled me towards him. So we sat. We sat, the two of us. 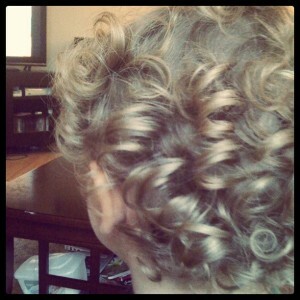 He watched TV and petted my arm, that he still hadn’t let go of, and I watched him, and petted his mop of curls. That moment, one of a million. Does it add to the story of me? How about to the story of him? Or was it just a nice moment? And yet, I have moments with a little boy patting my arm. I have moments with the sun on my face and the wind in my hair. I have a million other moments, some happy, some not, some big and some little. Those moments are part of me. I am writing some kind of story here. It may not be a bestseller or top any kind of chart, but this story WILL be good. And the character development may take a while, but it’s getting there. Moment by moment. Great post. Made me think. Sometimes I feel like the small moments are the key moments… making a life Forrest Gump style. Yes, yes, yes to the whole thing, but especially that last two paragraphs. There’s this thing where I used to think of getting older as a kind of fuzzy concept and now it’s real. I can think that when I’m 40, Olivia will be 10. There is a definite marching forward of time, toward the end, that I didn’t see before. It is weird, and it is scary, and I wonder if it will end before I see it ending in my head. Very good stuff. I think we remember little moments for a reason, and for me, blogging has helped me see the connections between those little moments so I can figure what they mean once I add them all up. Because yeah, all those little moments are the story of my life. Those curls…who wouldn’t linger on the couch and pet them???? This spoke to me directly, “how does that influence the Ginger that is sitting here right now?” 😉 Seriously though, this has been on my mind recently too. I’m not 100% sure I’m happy with aspects of my life, and I’m trying to figure out how to rewrite and change things so I don’t regret it later. Being a mother has changed me in ways I never imagined, and I’m still trying to figure out what that means for other dreams I had. It’s all very complicated. Write it all down, even if it’s just in a journal. It’s interesting – I guarantee it. I’ve been mulling my own mortal timeline lately. It kind of blows. I wish I could submit paperwork and get approved for another fifty years or so. I think every moment is something. Every moment enhances, detracts from, changes your experience. And Jackson’s too. He might not remember, with words, that you sat back down and let him touch your arm but his emotional memory is fuller because of it. I like this — your — way of looking at life. It slows things down and while I am not forced to appreciate every moment, because let’s face it, some of them are fairly unappreciatable, I at least notice them. OMG THE CURLS! LOVE THE CURLS! I have super-curly, dark hair. My daughter has straight blond hair. Go figure. Wow. Great post. There are definitely pieces of the past that I think about on a regular basis. Believe me, I have delved pretty deep into trying to understand how I ended up at this point in my life. I can link directly back to the moment something happened and see how it played out throughout my life. It’s usually the small things, words that were spoken, tiny gestures… that end up shaping who we are. I love, love, love this post. I think it speaks so much to why I blog. I want to remember the moments, though sometimes I’m not always sure how to capture them. Eric and I love to play revisionist history–we take seemingly insignificant moments of our lives and guess what would have changed if they hadn’t happened. It’s a lot of fun, and definitely makes me think differently about our ordinary. Also, those curls are LUSCIOUS. LUSCIOUS. Previous post: The Cure for the Common Funk?